On the day Elvis Presley died, there was an interview by a Boston reporter with an English classical music critic who wrote for a major London newspaper. True enough. 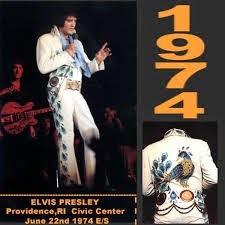 Several years before his death (in 1977), Presley came to Providence. He was performing at the cavernous Providence Civic Center (now called the Dunkin’ Donuts Center). My husband and I decided to take one of our sons and friend of his, both probably 13 years old. The place was packed, and then some. We sat through a comedian’s antics. We waited. Then a huge spotlight came on, the theme from “2001: A Space Odyssey” blared. There were loudspeakers everywhere. And Elvis jumped on the stage. His spangled white suit had the appearance of being illuminated with tiny blinking lights. By this time in his career, he was beginning t gain weight but nobody cared about that. We cared about the voice, the words to “Suspicious Minds,” “Blue Suede Shoes,” “Heartbreak Hotel.” That was it. The pinnacle. The real thing. More than once, he repeated the question. Then, with grace and kindness thanked her and bent to kiss her cheek. That was it. A gesture above and beyond. An unexpected kindness, thoughtfulness. This was the man who could glitz into royalty. The lights went down. The audience sighed. In a minute, the stage was empty and Elvis Presley has disappeared. But royalty? Don’t ever doubt it. The King was here and we saw him. And not one of us knew of the sadness that waited down the road.